They are by seniors Shanna Behrendsen and Laura Schultes who claim Rolfe as their hometown. And we've posted the commencement remarks delivered by Superintendent Dennis Pierce who has had a long tenure at Poky — perhaps over three decades with the school system. Shanna's parents are Mike Behrendsen (1961) and Joan Zeman Behrendsen (1970). Mike and Joan also have a daughter, Jessica, who graduated from PACS this year. I remember Jessica from last summer during the all-class reunion when she was on the custodial staff at the Rolfe school and helpful with preparations and cleanup for the event. She is an exceptionally responsible and loyal worker and was firm in making me obey the rules. Miss Marcum would have loved Jessica's adherence to rules and sense of discipline. Laura's parents are Ken and Carmella Schultes. 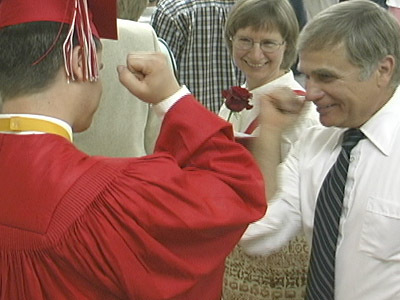 There were also plenty of other students and parents at commencement who claim Rolfe as their hometown. Congratulations to all of them. I attended commencement since I am close to Ben (Poky 1961) and Sylvia Olson whose son, Sky, was graduating. Ben's sisters were also in town for the ceremonies, and it was neat to reminisce, especially with Marjean (Poky 1964) who was played against me in basketball. Jerry Farlow (RHS 1955) says he dated Ben's oldest sister, Jerilyn (Poky circa 1960), when he and she were students at the University of Iowa. Jerilyn says she can't remember Jerry. It always feels a little weird when I walk into the Pocahontas school, having seen it as the rival when I was in high school and possessing vivid memories of frustrating games and spraining an ankle in its gym. Poky's coach was the renowned Charlie Weatherwax, a rotund and flat-topped man. He was intimidating, and his basketball teams were winners, often going to the state tournament. Shanna and Laura talked about change and how it is inevitable and how Rolfe's merging with Poky has given them opportunities they could not have dreamed of in a diminishing student population at Rolfe. After I videotaped Ben and Sylvia and the rest of the Olson family congratulating Sky in the receiving line and walked in the rain and chilly, gray air to my car while reflecting on the changes, I found myself humming, "No man is an island." It was a melancholy, yet beautiful day. It seemed impossible that 11 years had passed since I hung around the Rolfe school with a camcorder and documented the last days of the RHS class of 1990. It also seemed remarkable that I knew so many people from both Rolfe and Poky who gathered together as a unified clan at this year's graduation. And you would be pleased to know that Roger Witt of Rolfe (RHS 1949) is the president of the PACS Board of Education. Also, the colors the boys wore with red robes and gold ribbons for their honors medals reminded me of the cardinal red and old gold of Rolfe High School. I'm not sure why the song, "No man is an island" wafted up from my subconscious. In some respects, it reminded me that I was not an island at the event but was interconnected with the clan that had gathered, even though I lived 100 miles away in the small town of Gilbert, just north of Ames, and even though I was a liberal visiting a conservative community. Indeed, I was reminded that I am made of the fiber of that clan, and as much as I don't want to be judged by stereotypes, I should not judge other people or the rituals of a town with with stereotypical thinking. The night before the commencement exercises, I was at a fine party at the Olson farm where they served great shish-ka-bobs, baked beans, and potato salad. Ben's mom, Dorothy Olson, had made enough of the potato salad to serve 100 people. Fortunately it was the best dish at the event, edging out the wonderful cubes of beef from Wood's Grocery Store that Ben had grilled earlier in the day, and plenty was left over to savor the rest of the weekend and into the next week. At one point at the party, I got caught in an argument about the Princess Pocahontas statue that stands on the east side of town on Highway 3. I felt alone in the argument. Two women adamantly pointed out that the statue is a fine work of art and represents a popular style from the 1950's that is valuable to retain. They also contended that the statue was made to honor the Princess and her people. I said understood their arguments, but I also called the statue garish and said that if white people were to have a statue that represented a race they had oppressed, then the statue should be done with dignity. I even suggested that if the Shaw family ever stops maintaining the statue (which I doubt will ever happen), that the city should not put money into it. Instead, I proposed that the town could build a new statue near the digital kiosk in the triangle at the intersection of Highway 3 and Main Street where people have already established a beautiful grassy area bounded by field rocks. It seems much more the gateway to town than the current, shabby location of the statue. I went on to suggest that the city could ask input from representatives of Native American tribes in order to select an image that would indeed honor their people who have been pushed out of the areas they once inhabited. I also suggested that the statue be one of elegance and not kitsch. Still, I did not feel understood, and when I think about the town of Pocahontas and the statue (which I deem to be ugly) it's easy to stereotype all the citizens of the community as being blinded to the issues associated with the current statue. There have been magazine and newspaper articles about such works of art, and often the Princess statue is featured. In fact, there was just such an article in the Des Moines Register a few weeks ago with a huge color photo of the Pocahontas statue dominating the page. There always seems to be a sentence in these articles, saying something to the effect that the people of the town are very proud of their statue. Irene Shaw, the octogenarian who owns the monument, has been very quick to point out that it is she, and not the town, who owns the statue. The 25-foot tall statue was conceived of in the 1950's by Pocahontas attorney Albert J. Shaw; however, he died before the project was erected, and his son Frank Shaw (also an attorney and husband of Irene) saw that it was finished. Irene, a widow for a number of years and well-known as a Poky matriarch and patron of the arts, has continued the maintenance of the statue, however, it is reported she is currently living with her son in California where he is a Beverly Hills attorney. Her daughter is chief judge of the Iowa Court of Appeals, so who knows what the family's future stake in the statue will be. Bless her heart, Irene believes the statue to be a thing of virtue. In some ways, in my mind, it's not as bad for an individual or family to have such a distasteful statue, because this is a nation that values freedom of speech. But it does seem inappropriate for a community to invest public funds in insensitive artwork. And I wonder if the citizens of the area are really all that proud of the statue. I don't want to belabor this Princess Pocahontas thing, but over the past few days, I have thought of alternative tacks that I could have used in the argument. It's often easier to know what to say in hindsight than in the moment of frustrating debate? Here's what I would want to have asked? Do you see beauty in the current statue? Do you see courage? Faithfulness? Wisdom and intelligence? Does it elicit feelings such as compassion or grief? Do you see any connection to her people and their plight at the hands of European immigrants? Do you get a sense that the young woman loves to commune with nature and considers the creatures of the earth to be her friends? Do you see playfulness? I would think most people would say "no" to all those questions. Then I would go on to say that a dominant culture, such as our white culture which has committed its own form of genocide against the Native Americans, when it builds a statue to honor one of their people, should do so in a way that exudes at least a few of the qualities listed above. Otherwise, the statue portrays no sense of the Indian maiden's humanity and is not an honor but a debasement. The women in the debate at the Olson party said the Princess Pocahontas statue was in the same genre as the statue of Paul Bunyan near Bemidji, MN and of Albert the Bull in Audubon, IA and wondered why I was more critical of portrayal of Pocahontas than Paul or Albert. First, I would say that neither Paul nor Albert fall into a category of an oppressed culture being interpreted by a dominant culture. Two, I would say that the statues of both Paul and Albert have more redeeming qualities than that of the Princess statue. So there, I have said my two cents about the Princess Statue. I also found myself in a conversation with Sky at dinner with the Olson family at the Chateau. I asked if the senior girls would be wearing white and the boys red for graduation. He said they would be and that they were proud of the tradition and that it had nothing to do with gender bias. I call the practice a form of gender apartheid, and although I have seen the tradition in many schools, I still do not think its commonness makes it appropriate. Sky felt contrary, saying that the two colors added visual interest to the day. I jokingly suggested the school could have two colors by having tie-dyed robes to which he responded that I could wear a tie-died outfit if I wanted. I reminded him I had already graduated and didn't care to go through such a routine again. When I asked Sky why the boys always wore the red (what I call warrior red) and the girls wore white (what I call virgin white as in weddings), Sky exclaimed that boys like red and girls like white. Whoa! I stepped out of that conversation. Sky who has been brought up by Libertarian parents and who is a pretty independent thinker — often more critical of the system than I am — was not budging from his allegiance to the school's tradition. (That's fair enough. It's his graduation, not mine.) However, the next day when the family was looking at photos of school events, perhaps a prom, I saw the beautiful, warrior red evening gown of one of his classmates and suggested to Sky that at least one girl seemed to like red. He grinned, albeit only slightly, and mumbled something about my catching him on a generality. I left the conversation at that and didn't push on to other of my pet peeves such as naming the Pocahontas boys' sports teams the "Indians" and the girls' teams the "Maidens." Why are they not all called the "Indians?" Or why aren't the boys called the "Braves" or "Warriors" to more closely parallel the "Maiden" nickname. Or for that matter, howabout the "Boys" and the "Maidens?" That would be even more parallel. (I've thought about school nicknames before, too, for instance when Rolfe started girls' sports in 1959 and called the girls' teams the Rammettes. I never did like the term. It seemed diminutive, but then it would have been hard to call the girls' Rams. I guess we could have called ourselves "Sheep," but that wasn't macho enough for most people. I can hear the cheer squad now, "Let's go Sheep" or "Go get 'em, Sheep." Or imagine a Homecoming float moving down Main Street with a giant, fleecy creature grazing on a green football turf with a sign saying, "Sheep power." I have to grin at the thought. 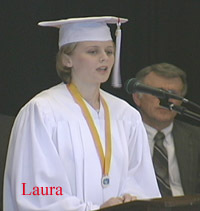 Graduation recognizes the accomplishments of students — i.e. earning sufficient credits in the various required and optional subjects (as well as keeping in line with the authority system of the school.) It is also a rite of passage — a recognition of youth becoming adults, leaving parents and families, and in most cases for rural Iowans today, departing from their hometowns. The passage has many elements — physical, emotional, spiritual, and intellectual to name a few. Why then, I ask, are there different colors for the boys and girls? Why not view the seniors as complex humans going through this ritual rather than by gender? And why the pairing of boy and girl couples for the recessional? Is graduation in some way modeling marriage? There are many ways to live out our lives. Sure, I know that most people choose heterosexual marriages, but some enjoy single lives, some join monastic orders, and the list of wholesome options goes on. I haven't been to many collegiate graduations lately, but I don't believe they conduct their ceremonies with gender color differentiation and male/female coupling of the graduates. And I've heard that hospital nurseries no longer wrap the baby girls in pink and the boys in powder blue. Most people I talk to about these things don't see the issues my way, so I accept the fact that mine are somewhat solo views. However, I wish that people were less defensive and loyal to what they call tradition. (When I was at RHS, we all wore gray robes — so just when did the dual color system of Rolfe's red and gold or Poky's red and white come into being for commencement?) I wish instead that people were more willing to explore the nuances of the issues and to come up with creative solutions that would blend past symbolism with new imagery and be the basis for the traditions practiced by future senior classes. How does this relate to the song "No Man is an Island?" Well, when I walked to my car in the chilly rain, feeling isolated with my minority thoughts and a bit like a foreigner (or an island in the sea of people at the commencement services), it was good to be reminded of how we are all connected and part on the same fabric. And if I want people to know me for who I am rather than judging me by stereotypes, then I need to look at the stereotypical ways in which I judge other people. The people of Pocahontas County and of the PAC school system are complex humans with many elements — physical, emotional, spiritual, and intellectual to name a few. I can offer my views but also admit that I am not in a position to know what's best for their people. There was another way the song "No Man is an Island" was significant. The commencement addresses, especially the one by Superintendent Dennis Pierce, emphasized the achievements of the senior class. It's great to extol such remarkable achievements, and as the Superintendent often said, they were "Amazing!" It's hard for me to fathom those numerous and esteemed accomplishments, and I too, say, "Amazing!" I also recall a few years ago when the PACS high school principal spoke at graduation and told how great the seniors were as competitors. I wish I had the text of that speech to count the number of times he used the words compete, competition, or competitors. A spirit of competition is good, but I wondered why a spirit of cooperation was not also extolled. Certainly in a class of some 70 students, there would be some whose mode of living is more one of cooperation that competition. When Superintendent Pierce said this year, "but what’s most important of all? Is that you excelled in the academics. Your class graduates three Iowa scholars and one national merit scholar. Fifty-six out of 68 of you graduating today are going on to further their education," I wondered what it felt like to be one of the 12 students not enrolled in an advanced education program. I think of the parade of people who have graduated from the Rolfe schools. I wonder how many feel at home with themselves and in the world. Some alumni have no further education than their high school degrees and some have not veered far from their hometown but have have simple jobs they do with diligence. I don't know their inner lives, but some of these people seem at home with themselves and the world, and I envy their dispositions. I also know a brilliant set of twins who graduated a few years ahead of me in the 1950's and excelled at academics but whose lives ended tragically. At least one, if not both, never achieved the success expected of him because he seemingly was never able to feel at home with himself. How does this relate to the song "No Man is an Island?" Well, there seems to be a heavy emphasis on a certain kind of success in our schools. However, just as aeronautical engineers need pilots and pilots need air traffic controllers, and airports needs ground crews (you know the people who wave the flashlights to direct a plane to the terminal) and mechanics, and those who travel by plane want dependable baggage handlers, so does every state director of education needs school superintendents who need teachers, bus drivers, cooks, custodians, media specialists, nurses, secretaries, parents and students. No matter what our skills and potential for success in terms of educational degrees, income, or accolades — no one is an island unto him or herself — we need one another to get our work done and for personal support. I think the people of the Pocahontas schools know that. I hear bits and pieces about the mock trial program from Sylvia who tells me that true teamwork and building trust are big factors in the program's tradition of success. However, at commencement, I would like a balance — to hear as much about cooperation as I do about competition. I would also like to hear about elements of the educational experience that are not generally touted. Was there a day when a student had a wonderful aha when finally learning to write a haiku? Was there an amazing revelation when a student realized writing his life story was important? What there a time when a late-blooming student began to take school seriously because cooking was her main aptitude, and her teacher took a special interest in helping her learn about food and nutrition? Was there a time when a student began to take physics or math more seriously because he discovered the subject matter would help him be a better car mechanic? Was there an exceptional sense of compassion and camaraderie modeled by special education students whose graduation is in every way as significant as that of the straight A students or others who wear the gold ribbons and honors medals. I've heard a story about runners in a Special Olympics race that goes something like this. The lead runners are into the final stretch of the race when they turn and see that another runner has fallen. Instead of forging ahead across the finish line to "win" or be "number one," they return to the fallen boy, help him to his feet, and all the runners cross the finish line together. I am moved every time I hear the story because their act not only affected themselves, but a spirit moved through the arena, in an electric way, touching and inspiring the fans who stood to applaud the magnificent act of compassion and cooperation. There are many examples that could be incorporated into a commencement speech — especially one by an administrator who can see things from a veteran educational perspective. In that way, commencement could indeed be about the complexity of the graduates with their many elements — physical, emotional, spiritual, and intellectual. Otherwise, in one of the biggest annual rituals that a community holds, we end up praising competition and academics in a way that may symbolize that those qualities are all that is needed for success. A competitive spirit and academic achievement are important, but they are not everything, and they should not be the only driving forces for a school or its commencement exercises. It's important that, "No man is an island" wafts into our souls occasionally. Among other things, it reminds us that neither Rolfe nor Poky are isolated entities, nor are we as individuals separate from each other. Our county is losing population as fast as any place in the nation, our state's rural economy is weak, and in many ways, rural issues and urban issues are two sides of the same coin. I could recall some of the words to the song but not all of them, so I searched the Internet. I hadn't realized the search would be as complex with so many published uses of the line, "no man is an island." Fortunately, however, I finally found a site with the full lyrics and links to three different recordings in MP3 file format of the words written by Joan Whitney and Alex Kramer. The first eight lines are what waft through my mind the most. "No man is an island, entire of itself, every man is a piece of the continent, a part of the main. If a clod be washed away by the sea, Europe is the less, as well as if a promontory were, as well as if a manor of thy friend's or of thine own were: any man's death diminishes me, because I am involved in mankind, and therefore never send to know for whom the bell tolls; it tolls for thee." 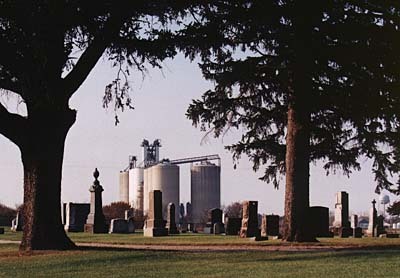 Clinton-Garfield Cemetery southeast of Rolfe. Pro Cooperative grain elevators in distance. Photo by Helen D. Gunderson. I've said more than my two cents worth. If you want to write your thoughts and send them to us, we will post them in the essay section, or you can submit them directly to the forum page. Or you can join us on Saturday nights at 9 o'clock Iowa time at our hosted chat room. By the way, Sky was also a member of the championship mock trial team and was the only National Merit Scholar from Poky. That's a terrific accomplishment considering that he and his younger brother Grant (a PACS sophomore) are partially home-schooled. During most years, the boys have left Poky and their public schooling in November and gone with their parents to live on their boat in the Bahamas, returning in the early spring to resume school with Ben and Sylvia preparing to plant their corn and bean crop. Grant also participated on a PACS mock trial team that placed high at state and was one of two students in that meet given an award as an outstanding attorney. Grant loves to draw cartoons, and according to his mom, has some jokes about Rolfe that I wouldn't appreciate. And from what I personally have heard of Grant's dry satire, I know I don't want to ask to hear them. He's a great kid even if he doesn't fully appreciate that town 12 miles northeast of Poky that is diminishing faster than the county seat town. And we get along fine. We even spent a morning facing each other from opposite sides of the glass, washing windows at the Olson home in preparation for Sky's graduation reception that afternoon. And we had fun while we were at it.